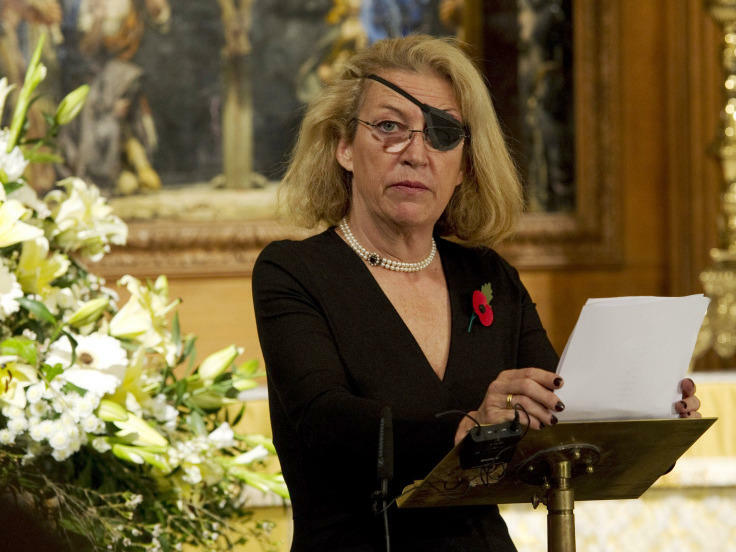 Marie Colvin of The Sunday Times, at a service for fallen journalists in 2010. We were exhausted after a long hot day of reporting. Tripoli had just fallen, and it was almost sunset. We pulled up to the house of Muatassim Gadhafi, one of Moammar Gadhafi's most feared and loathed sons. Even though we were all much younger than Marie Colvin, we were discussing calling it a day without venturing inside, as night was falling and, frankly, we were tired. But Marie quickly clambered up the ladder helpfully provided by local residents to scale the massive wall encircling the property. We reluctantly followed. While Marie — an American from Oyster Bay, N.Y. — was largely unknown in her home country, she was a legend in the United Kingdom. Her reports for the British Sunday Times from war zones across the world illuminated the tragedies and perils that ordinary people caught in extraordinary events face. Like that day last August, she was often the first person in somewhere, and frequently the last one to leave. Marie lost her left eye covering the fighting in Sri Lanka in 2001. She never deigned to get a prosthetic, rather proudly and raffishly sporting a black eye patch. As a woman in a male-dominated field, she went where many feared to go and wrote lengthy pieces detailing the terrible atrocities she witnessed. She was also a supportive comrade and a friend to many of us who work in the Middle East and beyond. She lost her life in Homs doing what she believed in. Marie, in her mid-50s, confessed to colleagues in recent email messages that the carnage she was witnessing in Syria was some of the worst she'd ever seen, and for over 25 years she covered some of the most terrible things humans can do to one another. She wrote on Facebook in one of her last messages that "getting this story out is what we got into journalism for." Her last story in The Sunday Times was headlined "We Live In Fear Of A Massacre" and described Baba Amr, Syria, as "a city of the cold and hungry, echoing to exploding shells and bursts of gunfire" where frightened women and children gathered in a "widows' basement." Some will argue, as they always do after a terrible loss, that journalists should not put themselves in harm's way; that the price of bearing witness is too high. Marie already answered that question. "Many of you here must have asked yourselves — or be asking yourselves now — is it worth the cost in lives, heartbreak, loss? Can we really make a difference? "We go to remote war zones to report what is happening. The public have a right to know what our government, and our armed forces, are doing in our name. Our mission is to speak the truth to power. We send home that first rough draft of history. We can and do make a difference in exposing the horrors of war and especially the atrocities that befall civilians." Her legacy is in the words she left behind, the lives she changed and in the example she set for us all.